This campaign is available for the whole lineup of the flagship EXAS EVO Exhaust System series from GP Sports! A great campaign applicable for a wide array of applications. 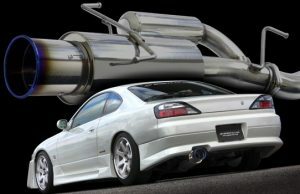 An excellent opportunity those looking for an original top quality high performance exhaust at a massive discount. This original combination of high grade stainless and beautiful adjustable titanium tip and power chamber provide unique style and performance only available with the EXAS EVO Exhaust System! Get ~JPY22,000 discount and/or get up to a 17% discount off RHDJapan normal sale price!